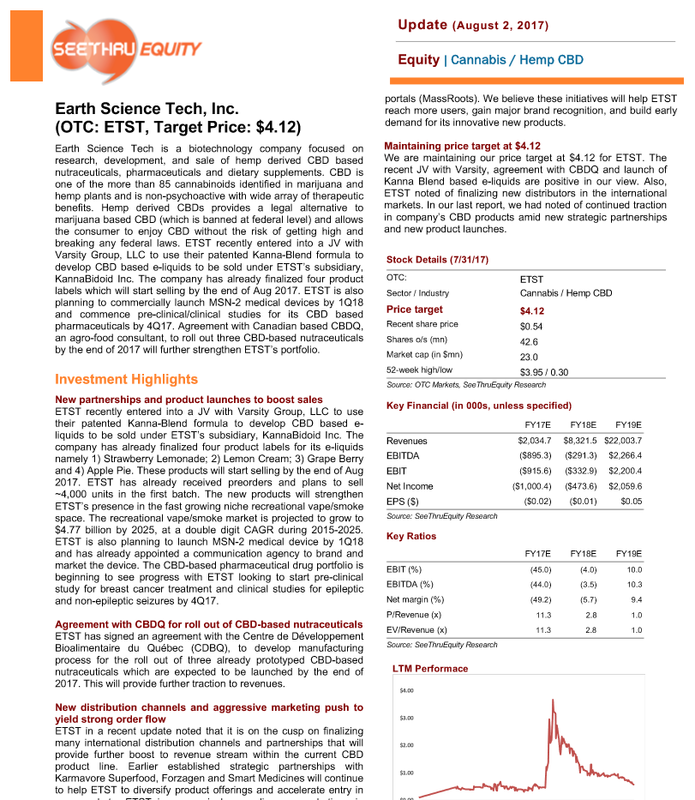 "Earth Science Tech (ETST) has been working hard to get out ahead of the yet-nascent CBD market and looks to establish itself as a front-runner in the space by building a strong IP portfolio. 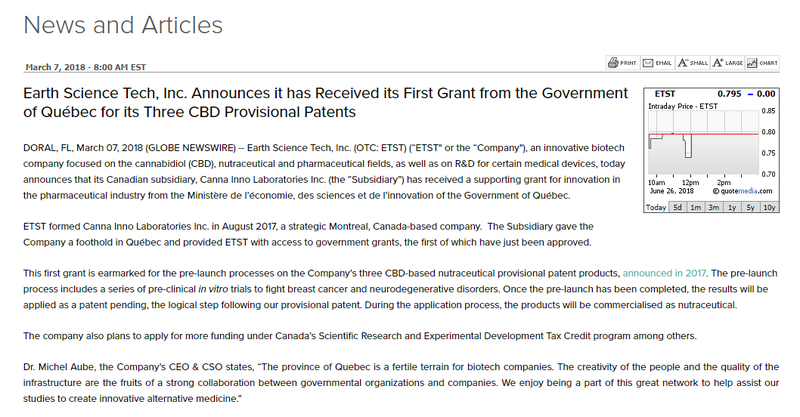 The company has already acquired a ready supply of food-grade, Hemp Oil Enriched with CBD, a product which nimbly leaps over lagging regulatory hurdles, as the product is currently legal in all 50 states and over 40 countries worldwide. Positive preliminary results obtained in October via the company's ongoing Sponsored Research Agreement with the University of Central Oklahoma (UCO), showing an approximately 90% inhibition rate with the appropriate dosing in breast cancer cells (only 50% inhibition for normal cells demonstrates efficacy nicely), using their Hemp Oil Enriched with CBD in animal models, subsequently led to a provisional patent filing with the USPTO (United States Patent and Trademark Office). Invasive breast cancer currently hits about one in every eight U.S. women, with around 40k fatalities estimated for 2014 alone, despite gradually improving death rates due to medical advancements." 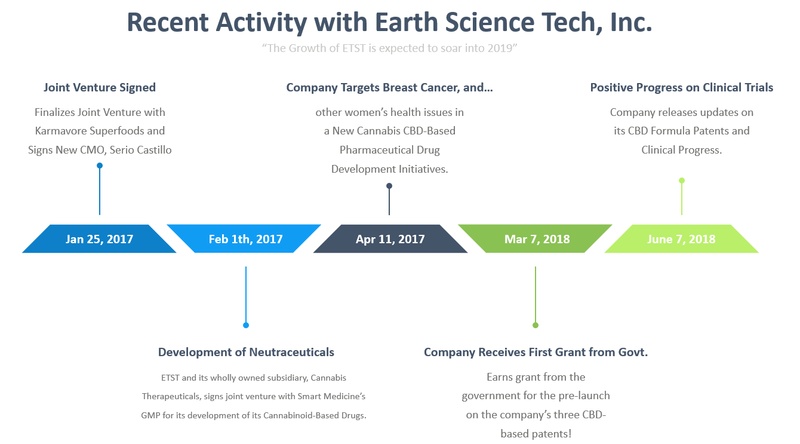 Clinical Trial: "Cannabinoid Science Advancements Fuel Latest Clinical Trial Developments for Efficacy of CBD Therapies and Patents - Company Enters Stage 2 Of Trials for Cannabinoid Compounds"
ABOUT NUTRITION EMPIRE (www.nutritionempire.com): Nutrition Empire a wholly owned subsidiary of Earth Science Tech, Inc. (ETST). Nutrition Empire is a specialty retailer and direct marketer of health, wellness, sports nutrition and dietary supplement products at competitive pricing. It operates through 2 segments: Retail and Direct Online. Some of its products will include sports nutrition products, vitamins, minerals, botanicals, herbal and dietary supplements, homeopathic remedies, green living products, diet products, beauty aids, and other wellness products. Nutrition Empire's upscale retail location will have competitive pricing and carry the top health and wellness brands as well as the hottest new sports nutritional supplements in the market place. The company specializes with one on one customer care, service, relationship and experience. The Nutrition Empire retail space is on ground floor of an upscale luxury apartment home community called the "Gable Ponce". The location Gable Ponce already houses a built in customer base with units Class A+ rental/living units above the retail shops where Nutrition Empire is located. The Gables Ponce complex in which Nutrition Empire opened its flagship store will soon begin its 3rd phase of development and looks to have roughly 1,000 apartment units when completed. Furthermore, Nutrition Empire is located adjacent to "The Village of Merrick Park" (www.villageofmerrickpark.com) which is a 780,000 square foot upscale lifestyle center consisting of mixed-use retail, residential and office project anchored by Neiman Marcus and Nordstrom, and has more than 100 other select retailers including Tiffany & Co., Burberry, Coach and Gucci. The Village of Merrick Park also houses Equinox gym (www.equinox.com), which was voted best gym in America by Fitness Magazine and I AM CrossFit (www.iamcrossfit.com/locations/coral-gables). Another vast plus for this Nutrition Empire location and new upcoming retail store is that it's under 1 mile from the University of Miami (www.miami.edu) (informally referred to as UM, U Miami, Miami, or The U), which is a private, nonsectarian university located in Coral Gables, Florida, United States that enrolls roughly 16,935 students.